Being a student myself, I have 6 cents on how To Be a Catholic in College. 1. Join a Catholic Club on campus. In your first week on campus, you will probably realize a couple of things. One is that the place is huge. Second is that you will see many clubs and organizations. Try to find a Catholic club on campus. 2. Beware of the courses you take. As a Catholic, there is no knowledge that is forbidden to us. It is always important to cross-reference these teachings with a reliable sources. Learning and understanding new perspectives are fruitful to your intellectual growth, but be careful of the things you accept as new truths. 3. Go to retreats regularly. Growing in faith as a community is a great way to maintain an active spiritual life during school. 4. Adopt a Saint. Your education will be a time where you experience a huge change. A good way to remain true to who you are is to adopt the traits of a saint . Saint Thomas Aquinas is an amazing saint and is the patron saint for students. 5. Know the fine line between independence and temptation. The freedom can be dangerous if not supported by a good faith life. Without a proper understanding of what is right and wrong, it is very easy to fall into a mentality where our temptation to do something is labeled ‘independence.’ Always seek spiritual guidance. 6. Pray. Your college education is not just the place where you get your degree. It is a place where you cultivate your spiritual learning as well. By prayer, we can grow to become the people God intended for us to be. The blessing of pets and animals is celebrated on October 4, the feast of St. Francis of Assisi. In the Scriptures, the act of blessing means ‘the imparting of power.’ The person performing the blessing is mediating that power from God to the person performing or the animal involved. To bless is more than an expression of goodwill and caring. To bless is to impart God’s power in person! 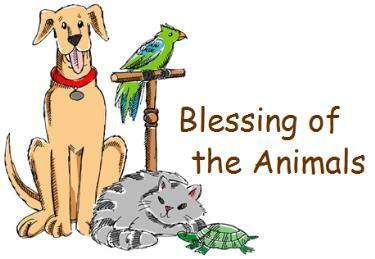 The blessing of each animal, means that health, healing and life are being mediated from God for the benefit of the animal. See you all with pets on October 4th at 6 pm. September 29: it’s a memorable day! I came to Kentucky 8 years ago on this day! I can’t forget all the love that I received and all the opportunities I found and all the ministries I was able to be part of. “Can I get 25cents?” Do you mean a quarter? That is the first question I asked after I came to this country. When I landed at New York airport, I was expecting a person to pick me up. I could not see anyone and I know his address and phone number and I CAME TO KNOW THAT I NEED 25 cents to make a phone call. Since I did not have any money in my pocket, I asked one “can I get 25 cents” “why” “to make a phone call”. “Are you new to this county? ““yes” “ do you know to make a phone call” “ I read the instructions. I think I can”. He took me to the public telephone booth and he inserted coin and gave me another quarter. I called my friend and came to know that he was in traffic. I still keep the second quarter that I received on that day with gratitude. That reminds me of the generosity of America. Thanks to all for your love. Let us share this love so that let everyone know that we are Christians by our love.